Lovely Betty in her coquettish pose graces the side of this bottle filled with glitter behind her. With an acrylic double wall insulation, drinks stay cool and condensation is prevented. Comes with a sturdy locking lid. 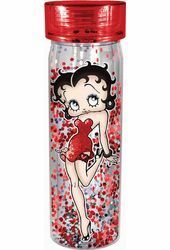 Holds a flirty 16 oz.